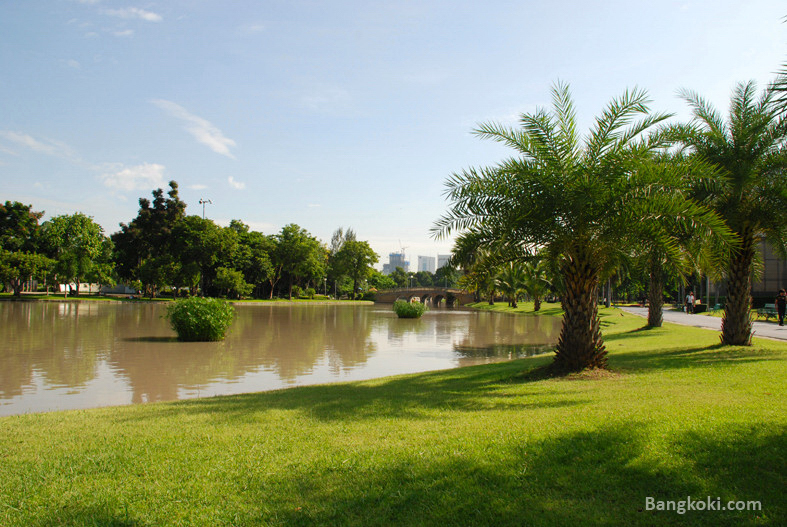 For somewhere often described as a concrete jungle, Bangkok has a fair amount of parks and open spaces which are very lively and perfect for relaxing and keeping fit. They do get pretty hot though, so make sure you stay well hydrated and take sun cream. 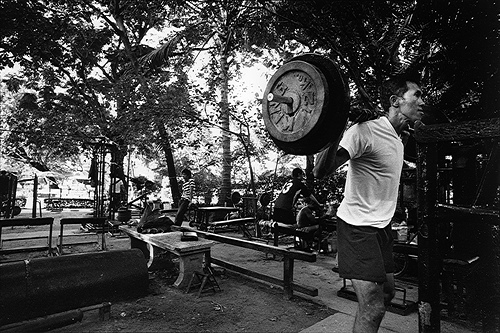 Many people don’t like training in busy air-conditioned gyms, and running through the streets of Bangkok is pretty tough given the uneven terrain, potholes and pollution issues. This makes finding a Bangkok park with shaded areas, fresh(er) air, nice surroundings and like-minded people a popular option. Take a visit to one of these parks and you’ll see people jogging, doing Tai Chi, yoga, rowing, weight lifting, cycling, aerobics and much more. 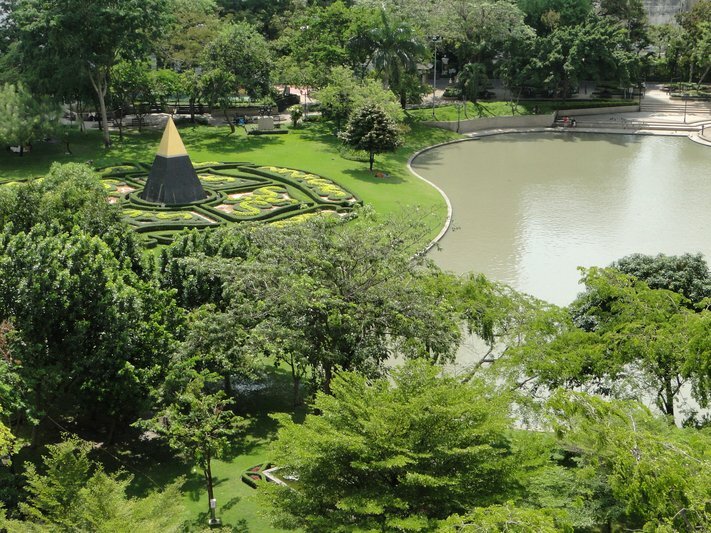 Below is a list of the best central Bangkok parks with nearest Skytrain and MRT stations so you can find them easily. These are not the only ones though – there are hundreds of parks and open spaces that can be used for physical activity all over the city. Lumphini Park is one of Bangkok’s most famous and well-known parks, and is probably the best all-round park for health and fitness activities. This huge space is located between Sukhumvit and Silom, making it perfectly located for many expats. The first thing you’ll notice if you come via the skytrain in the evening will be the huge aerobics class which has a few hundred people dancing along to irritating dance music. The Thais really get into it and it makes quite a surreal setting with the business district and skytrain in the background.The path that runs around the outside is 2.56km long and it’s very popular amongst runners, with a few running events being held here each year. There is a large lake in the middle and small rowing boats can be hired for a nominal fee. Popular tai chi and yoga classes add to the relaxing ambience and are held in the mornings and evenings. Boot camps are held by Total Body Training a few times a week and are a popular way for expats to train hard and meet people. There is also a swimming pool in the park, although you’ll need a health certificate to register and use it, which costs 100-200 baht and pretty much just involves a doctor checking that you have a heart beat. Next to the pool is an indoor sports centre with basketball, badminton etc available. In this corner of the park you’ll also find an outdoor gym which is popular with pumped up Thais who are about thrice the size of the national average. As well as all this, look around and you’ll see people playing badminton, frisbee catch etc. All in all, my favourite park in Bangkok (opens 4.30am). No-one seems to know the name of this park, so it’s often described as ‘the one near Asoke’. Another of my favourite parks, Benjakiti has a smooth 1.8km oval track that runs around the lake in the middle of the park. 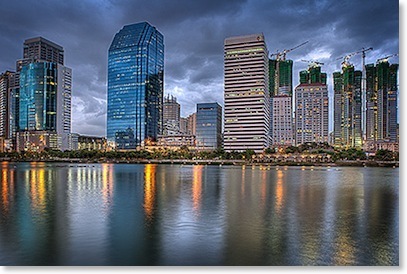 It’s not as shaded as Lumphini, but with a backdrop of lit-up skyscrapers it makes a great evening run. There is also a dedicated cycle track that runs on the outside of the main path, making it popular amongst cyclists. Bikes can be hired for 30 odd baht. Small paddle boats can be hired and the wooded piers on the side of the lake are often used for Thai aerobics or keep fit classes. There is also a skateboarding ramp and even a Buddhist meditation centre if you’re feeling stressed out. If you’re running, you can incorporate the tobacco factory next to the park into your run. It makes for an interesting running experience, as long as you don’t mind the smell of tobacco! Situated right next to Emporium shopping centre between sois 22 and 24 on Sukhumvit road, Benjasiri is small compared to the above two parks but is pretty well equipped with a path around the outside for running and badminton courts, takraw and a basketball court. A superb location but sometimes the drains around the park omit an unpleasant smell, which isn’t what you need when you’re gasping for breath. The area at the front is often full with people doing tai chi or aerobics, and Total Body Training runs a boot camp there at 6.30-7.30am on Wednesdays. 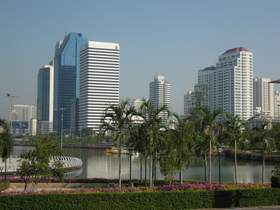 If you’re recording your runs, the path around the outside of Benjasiri park is approximately 0.75km long. Also known as Rot Fai or Railway Park, Chatuchak park is conveniently located right next to the above stations, and is right next to the world-famous Chatuchak weekend market. There are not so many sport specific facilities in Chatuchak park but Queen Sirikit park that runs alongside it has a great sports area with futsal, tennis and basketball courts. There is a reasonably well equipped ‘spit-and-sawdust’ style gym in the park on the opposite side to the skytrain. It’s often full of Thai bodybuilders, although despite their intimidating frames they are a friendly and welcoming bunch. The outside path around Chatuchak park is approximately 3km long. Sanam Luang is walking distance to Khaosan road and the Grand Palace. It’s a lively park with many people strolling, running, flying kites and playing football in the evenings. There are occasionally political rallies held here and at night many homeless people camp out. Get off the skytrain at exit 4, then turn right at Victory Monument and continue walking for about 5 minutes. Santhiphap park has a lot going on, much of it music-related but it’s also a nice area to relax and train and there aren’t many other parks in the immediate area. 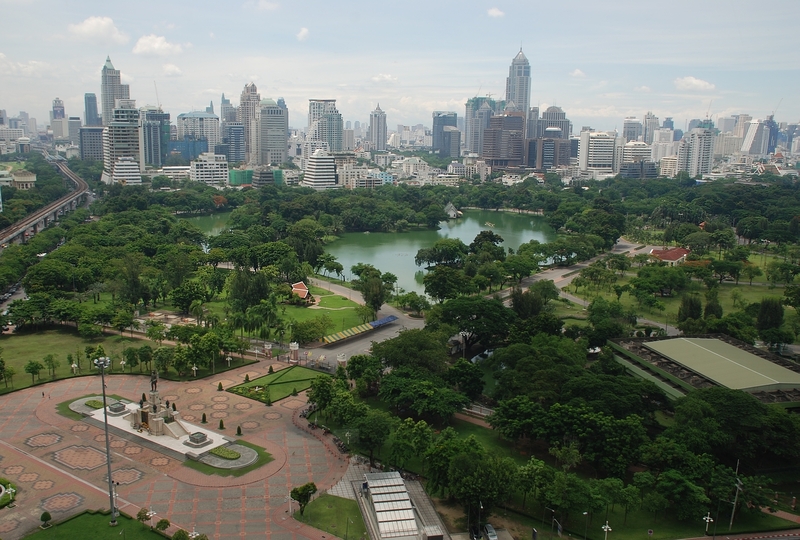 Situated on Sukhumvit 103 King Rama 9 Park is the furthest from the centre of all the parks we’ve mentioned but also the largest, with the outside path loop measuring 4.8km. This make it good for running if you’re bored with running short loops over and over. 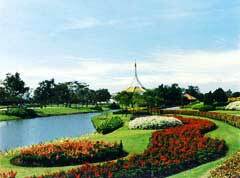 It’s a huge, well-kept park with a lush botanical garden zone, making it the perfect place for relaxation and exercise. There is also a purpose-built sports zone called ‘Sanam Rat’ which I’m yet to check out. I’d love to hear from anyone who’s used the facilities here. Chuvit Garden is a small park between Sukhumvit sois 8 and 10. It has no specific areas for sport but it’s very well-kept and makes quite a pleasant place to jog round or get a break from the craziness surrounding you. Much better sporting and keep fit options at the nearby Benjasiri or Benjakiti parks though. Not so much sport and fitness stuff goes on here, but in the evenings there are a lot of street performers and artists, and it makes a great place to watch the sunset over the river. Popular amongst locals and travellers. That’s loads of green places to visit, so if you’re feeling a bit claustrophobic in this hectic city or you need some fresh air, get outside to one of them, take a deep breath and enjoy! BASE is indoors but has a calisthenics frame for bodyweight exercise.